One of zinc’s most important characteristics is its ability to protect steel against corrosion. The life and durability of steel are greatly improved when coated with zinc. No other material can provide such efficient and cost-effective protection for steel. When left unprotected, steel will corrode in almost any exposed environment. Zinc coatings stop corrosion of steel in two ways – a physical barrier and electrochemical protection. Zinc coatings provide a continuous, impervious metallic barrier that does not allow moisture and oxygen to reach the steel. The metallic zinc surface reacts with the atmosphere to form a compact, adherent patina that is insoluble in rainwater. Typical coating thicknesses can range from 45μm to over 200μm. Research over many years has shown that the life of this barrier protection is proportional to the zinc coating thickness. In other words, doubling the coating thickness will double the life of the coating. Zinc also has the ability to galvanically protect steel. When bare steel is exposed to moisture, such as at a cut edge or damaged area, a galvanic cell is formed. The zinc around the point of damage corrodes in preference to the steel and forms corrosion products that precipitate on the steel surface and protect it. There is no sideways corrosion at points of damage. 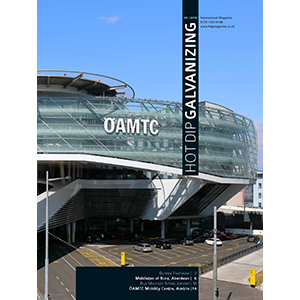 How much does galvanizing cost? 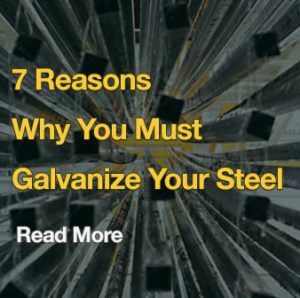 How long does galvanizing last?